Send a post found with Microsoft Social Engagement to your Customer Engagement instance to create a record. For example, you can automatically convert posts to cases for customer service, or to leads for your sales team. When you create a social activity, if the author of the post doesn’t have a social profile in Customer Engagement, the system creates a social profile and contact record, and then links the social profile with the contact record. When a record is created in Customer Engagement, you can see the details about this record in Social Engagement. Learn about the prerequisites to establish a connection with Dynamics 365 for Customer Engagement apps on how to configure your online and on-premises instance. You can define the information to show in Customer Engagement record details when a record is created from a social post. To familiarize yourself with the social activity record type or the Customer Engagement record creation and update rules feature, see MSDN: SocialActivity entity messages and methods, CRM Help & Training: Set up rules to automatically create or update records in CRM. Define the fields of a Customer Engagement entity that you want to display in Dynamics 365 Record Details in Social Engagement when a record of the same entity is created from a post. Add the fields you want to see in the Dynamics 365 Record Details when you define the entity details in Social Engagement. Social Engagement lets you select the record type to create when linking a new post to Customer Engagement apps. Depending on the settings in Entity Details, you can see the current values of the Customer Engagement record in Social Engagement when you load the record details for a post that was linked before. Only the custom entities in which are in relationship with the Social Activity entity are visible in Social Engagement. For more information, see TechNet: Create and edit entity relationships. In Social Engagement, go to Settings > Connections > Microsoft Dynamics 365. In the Microsoft Dynamics 365 Connections pane, select the Customer Engagement instance that you want to define entity details for. In the Dynamics 365 Instance pane, select the record type under Record details. In the Entity Details pane, select the fields to show in the Dynamics 365 Record Details form for the selected entity. Or click Add to add more fields. Reorder the fields using the up arrow or down arrow or remove fields using the Remove button . To apply your changes, select Save . In Social Engagement, click Posts on any Analytics page to see the posts list. Go to Social Engagement > Social Center to see your streams. Go to the post you want to convert to a social activity record in Dynamics 365 for Customer Engagement, and then click Link to Dynamics 365 . The Link to Dynamics 365 feature doesn't support Microsoft Dynamics 365 (on-premises) in combination with the Internet Explorer or Microsoft Edge browsers. Select from the available instances, and then select the record type you want to create from the Entity drop-down list. 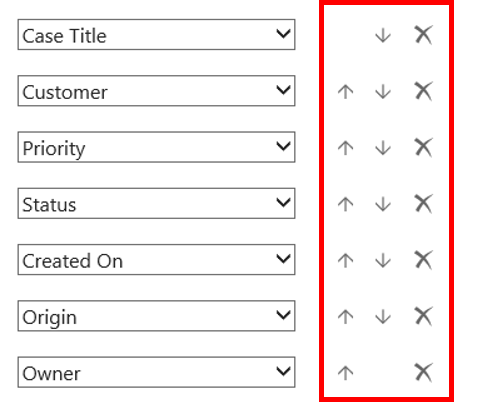 The Entity drop-down list shows only those entities that are configured in the Dynamics 365 Instance panel in the Dynamics 365 Record Details section. If a single entity is configured with an instance, it will be selected by default. Add any additional information, up to 250 characters, related to the record in Notes, and then click Create. The post now displays a Linked button along with the name of the Customer Engagement instance it is linked to. By default, the Customer Engagement app creates a Social Activity entity when a post is linked from Social Engagement and we need to convert this entity to a different record type. To automate the process, you can set up Automatic Record Creation Rules in the Customer Engagement app to automatically create records from incoming social activities. To learn more about the social activity record type or the Customer Engagement record creation and update rules feature, see MSDN: SocialActivity entity messages and methods, CRM Help & Training: Set up rules to automatically create or update records in CRM. When you create a social activity, Social Engagement sends the social payload as a JSON object to the Additional Parameters field of a social activity. The payload can be used as channel properties that define conditions for rules, and for setting properties of the record you're creating or updating. More information: CRM Help & Training: Set up rules to automatically create or update records in CRM The payload contains the most important fields required by Customer Engagement apps to consume tweets and Facebook posts. These fields contain information about the post that was sent: author, content, URI to the original post, URI to the post in Social Engagement, and some additional post metadata. Based on the post’s source, the content of the payload may change. Social Activity has an Additional Parameters field that receives the social payload as JSON from Social Engagement. To learn more about how to set up channel properties to work with Additional Parameters from Social Engagement, see CRM Help & Training: Set up rules to automatically create or update records in CRM. The JSON payload of this feature is described in the following table. N/A isretweet Determines whether the post is a retweet or not. A typical JSON payload is given here. If a post is linked to a social activity, you can open its associated record in Dynamics 365 Record Details. Only the custom entities in Customer Engagement which are in relationship with the Social Activity entity are visible in Social Engagement. For more information, see TechNet: Create and edit entity relationships. In Social Engagement, click Posts on the right side of any Analytics page to see the posts list. Select the post, and then click Link to Dynamics 365 . The Dynamics 365 Record Details dialog box shows all details for the associated Dynamics 365 for Customer Engagement record. 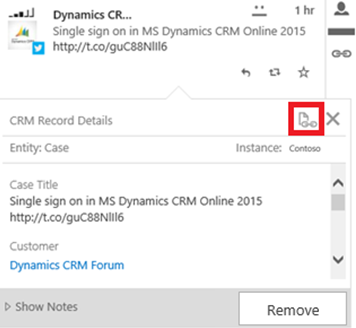 Select the post you want to open the associated record for, and then click Link to Dynamics 365 . 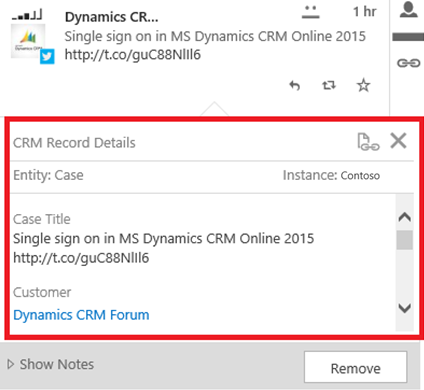 In the Dynamics 365 Record Details, click Open Record . If there are no rules, or no active rules, or the social activity doesn't meet the defined conditions, no target Customer Engagement record is created and the Open Record option opens the social activity. When the target record is created, the Open Record option opens the target record. You can remove a linked Customer Engagement record from a post. Note that removing a linked record from a post also removes any attached notes. Consider removing a linked record from a post when the link is no longer valid, is incorrect, or when you are considering creating a new entity record from the same post. Removing a link does not affect the linked record in Customer Engagement apps, but only breaks the link between the Social Engagement post and the Customer Engagement record. Once removed there is no way to re-establish the link between the same Social Engagement post and same Customer Engagement record. 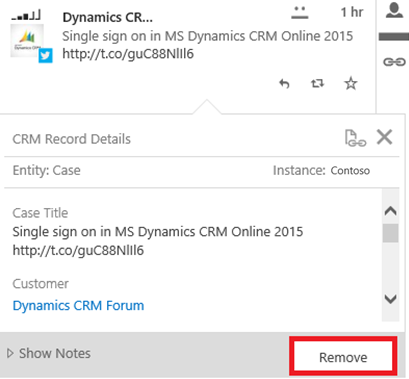 In the Dynamics 365 Record Details, click Remove.